← Calling all MC College students: Kick start your career and apply for the Beacon Program! Whether it’s pink hair or a new hair cut, the month of January was about helping the community by giving makeovers to those in need and to help raise awareness for children battling cancer. MC College students use their skills for the benefit of others, while at the same time expanding their technical experience by volunteering at community events. 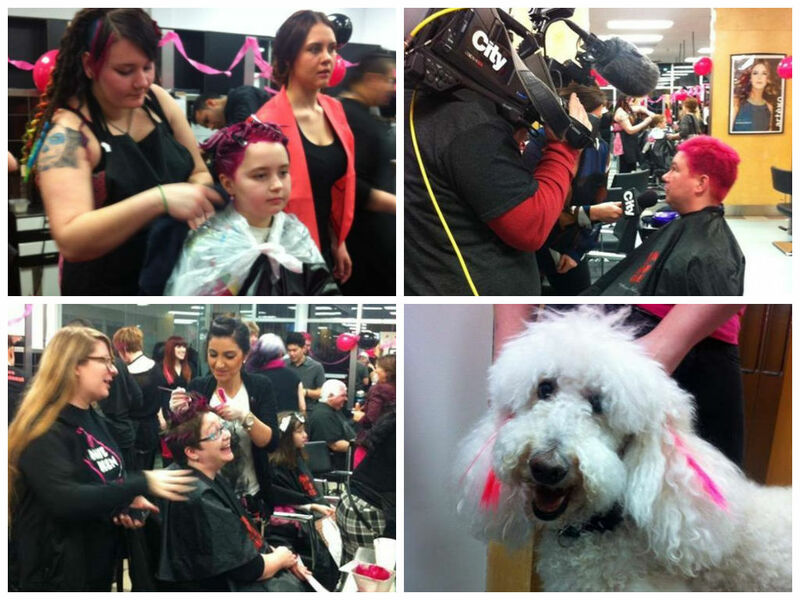 On January 16th, Edmonton MC College buzzed with excitement as students and staff “painted Edmonton pink” at the annual Hair Massacure event for cancer. From 6AM to 5PM, students pinked over 40 heads and beards (eyebrows included!). But what’s “pinking”, you ask? Pinking is when people raise funds for children battling cancer by bleaching and coloring their hair fuschia pink. Local celebrity, Bridget Ryan from Breakfast Television was on location to interview participants while they got their hair bleached and pinked by our students. This year, the campus was visited by a “furry special” guest, Freddy the Poodle, who wore pink extensions to help participants raise awareness! The second part of Hair Massacure will take place on February 14 at West Edmonton Mall, where MC College students will assist with shaving heads. On January 2, Vernon MC College students and staff were invited to put their skills to the test for those in need at Vernon Alliance Church’s Common Threads event. From 1PM-3PM students gave out over 20 free haircuts. 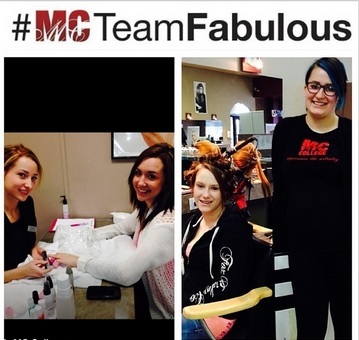 To kick off Vernon MC College’s #mcteamfabulous event, students from Seaton High School were invited for a campus tour and makeover. With High School graduation around the corner, the students received a new hairstyle, learned how to fabulously pose in selfies and experience what student life is like at MC College. Saskatoon MC College students and staff made a special visit to Parkridge Centre. Not only did the students give out mini manicures and hair touch-ups, they also taught the residents about basic body and hair care! Parkridge Centre is a long term care facility for over 240 residents ranging in age from Preschool to over 100 years of age.